Technology… It is one of those things that is always evolving, changing, and being pushed by professionals to become better. It is not something that ever stops and that can pose a problem for teachers who are usually trying to train students for the future. In reality, there is very little we know for certain that will be skills that will be used in the future. I know there is technology and strategies that I learned in school that are now defunct. I learned how to type on a word processor and had to manually figure out margins and formatting that is now just taken care of by computers. I learned how to use massive indices to locate magazines and articles that I had to hope were available in my local library while doing a research paper. Or, even how to use a card catalogue when trying to locate materials in the library. I was taught how to use all of the 20th century tools that were available, but over time the computer and then the internet replaced all of these tools with some that were more powerful. I adapted because I had to, but at the same time I always wonder what else I might have been able to learn if I did not have to learn all of these processes that were on their way out. I think overall, I learned how to be more patient when mining for information, but when I reflect on the education landscape that I inhabited it is truly a different world than what my students currently inhabit. To figure out how the education world had changed I began looking around for materials that could help understand the changes that we have seen and might see in the future. 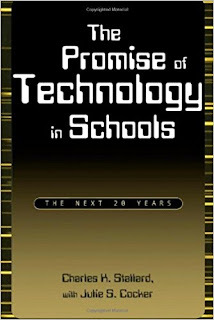 I came across a book called The Promise of Technology in Schools: The Next 20 years by Charles Stallard, With Julie Cocker that seems to have attempted at least to predict and understand the changes that were going to be coming to the education world. The book was printed in 2001 when I was Junior in High School, the War on Terror had just begun after 9/11, and technology was just becoming more monetarily available than ever before. 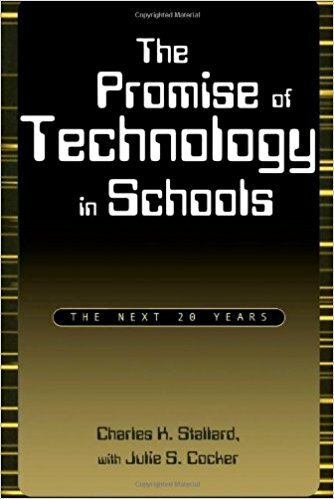 It is a book that seems to be mildly prophetic and helped me gain a little perspective on what I have encountered in my educational career as a student and as a teacher regarding technology. I plan on using this book to write a series on education where I will connect our modern world, some of the events of the last sixteen years, and see if I can glean where we might end up in the near future. Personally, I have found the book helpful and I am assuming that others will as well. The book does presuppose that the reader has an understanding of the basics of the technological landscape in 2001 and does use technical jargon to a certain extent. Overall, it is a basic study of the past, the present in 2001, and the future up until 2020. I think that the economic downturn in 2008 caused the timeline to become a little slowed, but overall I think that their principles have remained true thus far with small anomalies. Stallard and Cocker began their book by defining the terms Information Technology and Educational Technology and how they are often used in our world. In 2001 these terms would have come in conflict. Overall, the authors believe that the term Information Technology is a broad term that had yet to fully make itself felt in the field of education, but that overall was not that different than what had been taking place in other fields, such as the military or even stores. These different domains were creating educational materials that were using IT to train recruits through simulations or computer training. I can personally attest that at this time I was trained to work at my local grocery store by using computerized materials in a terminal up in the office. I learned how to use the register and the program associated with the machine by using the digital learning tools. The authors saw this as a place that educational materials were beginning to grow and that over time this would continually shape differently. The first chapter was a deep analysis of the effects of Hardware, software, and networking capabilities that continuously grew over time and complemented one another into larger and larger growth from the 1950’s to the modern day. Hardware continuously expanded using Moore's law and has been expected to continue, even though Stallard and Cocker believed it would stop in 2020 unless some new technology was developed. They also believed that software in the field of education was in its infancy in 2001 and I think that was true. The programs I used during this period were not that well designed and overall have fallen away over time. Some of the programs I used I fondly remember was Number Munchers, Oregon Trail, and Grolier encyclopedia (which I absolutely loved in 1995 and influenced online encyclopedias today) I also think that the growth of Google has changed the ballgame using these technologies, but overall the principles have remained the same. We still type,but now we have even more networking tools than we did before that make the process more seamless. The third engine of change in the field of IT was the explosion of networking, which began as students working together in the same building, but over time expanded to the internet. The authors talk at length about networking technology and how there were challenges associated with the products that were available in 1990. What seems obvious to us today was not as obvious then that infrastructure would need to be continuously updated. During the 1990s, I do think that there were more options as there were more companies available at that time installing networks, and over time we have now arrived at a place where WiFi or Ethernet is available, which has made some things easier to process. But overall, these three areas were what Stallard and Cocker identified as the agents that would cause massive change in the industry of education. I also think it was a good place to start in that it gave the reader a little history to understand alongside the technology. I think that most people don’t think about the network or the hardware. It is just something that is there and works. They believed that all three areas would advance significantly and would each have its profoundly unique impact on the world of education. They also believed that the field of education would adapt and change to the difference in the devices until we are totally permeated by small affordable devices that they had no idea what they would look like. My entire life and career has seen all of these changes. I have watch computer hardware become extremely fast from where it was when I was a child in the 1980s. I have also watched computer software change and become relatively reliable and much more powerful. And, networking has gone through many phases from dial-up modems to Ethernet to WiFi that I have used in my home and the classroom the changes have been profound. I also believe that reflecting back on this chapter that the authors were able to see where some the the trends would continue to explode and gives them some credence to where they think education might go in the future. I also found that this chapter was spot on with breaking down where there would be changes and simplifying where these changes would occur. Next time I plan to look at chapter two that will deal with Technology Adoption and Organizational Change.